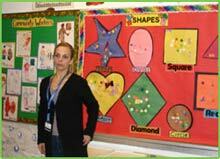 The Centre is staffed with qualified teachers trained in Early Childhood Education. Each staff member has knowledge of child development, and is experienced in the methods of child guidance suited to the ages of the children in the Centre. Our staff are graduated from a recognize university in a 4 years Early Childhood degree program, or from a recognize college in a 2 years diploma program. All staff has First Aid Certificate.